hey i was wodering what does the peace sign really mean. 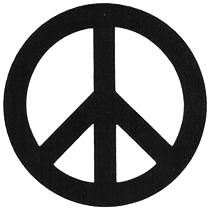 It was first designed as the symbol for the Campaign for Nuclear Disarmament. It always had the idea of peace behind it. It's a broken cross-- symbolizing a hatred for Christianity. People opposed to war are supporting the Anti-Christ. Footprint of the American chicken. Back in the late 60's it was also called a chicken track cause of the Vietnam war. The designer of the logo, Gerald Holtom, choose something that would be easily recognisable, like the radioactivity hazard symbol, and circular, so it would be suitable for a badge. It was not his intention to use a Broken Cross per se, but simply used the Semaphore positions of 'N' and 'D' for the internal markings.